Pretzel Logic's Market Charts and Analysis: Does Your Fundamental Bias Cost You Money? Does Your Fundamental Bias Cost You Money? I think many traders feel that Bernanke's printing press has given new meaning to the term "bull" market. Bears are tired. It's like every bear on the planet has been waiting for the "real" market to emerge since at least 2010. Personally, I've been quite bullish at times (early October 2011, and late 2012/early 2013 were probably my most bullish moments), but this market has felt, for lack of a better term, "unnatural" to me for a long time. But maybe that's just my fundamental bias. I can forgive myself when I'm bearish and end up wrong -- but I have a much harder time forgiving myself when I'm bullish and end up wrong. 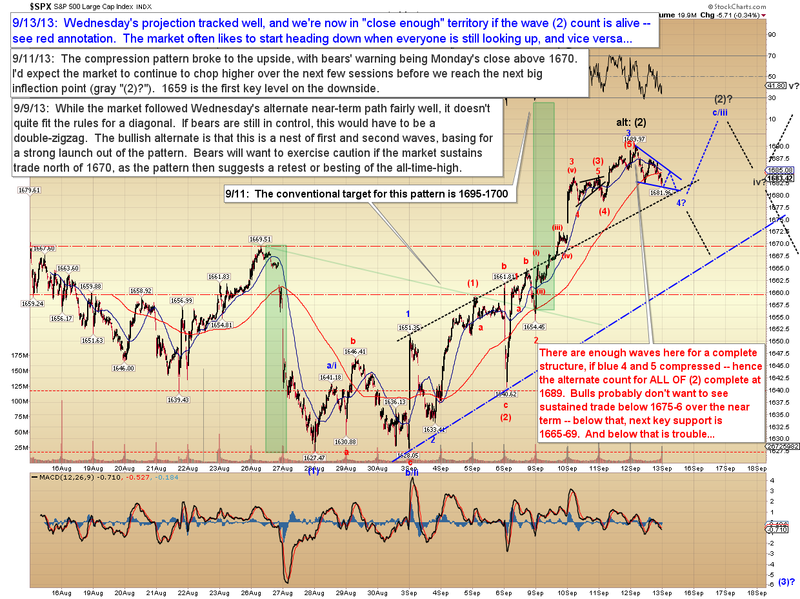 If I'm bullish and wrong, that error eats away at me in a different way. There's a self-chastisement of "you know better!" because it offends my core sense of what I believe to be True (with a capital T) about the world in general. I'm not sure if I can explain this in a way that makes sense, but I'll try: our beliefs represent what we stand for in this world. And what we stand for in turn represents who we are, in a meaningful sense. At least, it has meaning to us on a personal level. Our beliefs generally represent the core foundations from which we build our enduring life principles -- so beliefs translate into action. As a result, we all associate "who we are" with our beliefs to a greater or lesser extent, depending on the depth and strength of the belief. This is why religion and politics are such heated forums -- people feel criticized on a deeply personal level when those beliefs are challenged. They feel you are attacking not simply their ideology, but actually attacking them as individuals. Anyway, I think this human tendency is one of the challenges that makes it so incredibly hard to get away from our fundamental bias. It's much easier to forgive ourselves when we err on the side of our fundamental bias, because that error is in line with our self-image -- it's "who we are" to some extent. And we can forgive ourselves for "being ourselves" (we do it all day long!). Conversely, that same psychology causes us to criticize ourselves much more harshly when we err against our fundamental bias. Which in turn causes us to make more errors toward the side of our bias. It's worth examining. We all have a fundamental bias -- and I suspect it costs every one of us money at times. The big picture is essentially unchanged since last month. The alternate intermediate count sees the possibility that 1627 was it for the decline, and that the market is headed on to new highs. I'm presently still inclined to favor the bears (but maybe that's just my bias speaking!). There is both a bullish and bearish interpretation of the intermediate pattern -- the bull interpretation is called an “expanded flat,” and I discussed it at length last month. In conclusion, if this is indeed the wave ii/B rally the preferred count believes it is, then it should be nearing completion. If the S&P 500 moves above 1709 instead, then bears have their wave count reset and we’ll have to start calculating new upside targets, beyond the current 1695-1700 zone. Trade safe. Excellent post yet again, I've been following your blog for a while now (found you via minyanville), thanks for your insight. This post really resonates with be - I have to say I'm very much of the same bear-mindset, and that has caused me serious issues this past year. 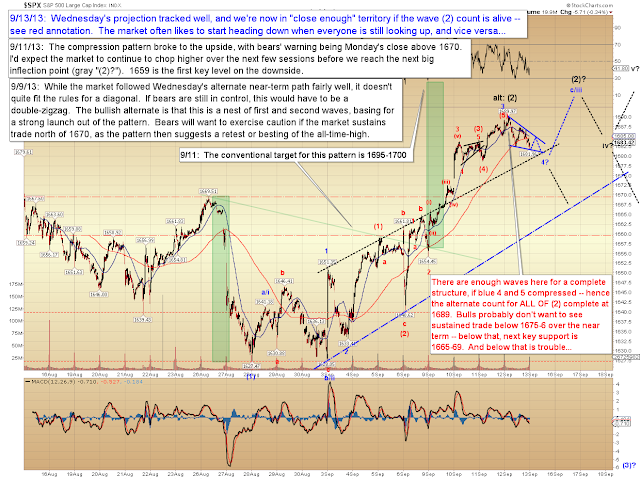 Having said that, I do believe we're at (or 1709 will be) THE top before a major crash. I'm not sure what event will occur for that to actually happen, but I'm a believer in technicals foreshadowing such events. BTW One solution is to the fundamental bias that I'm exploring is algorithmic trading. By defining your strategies algorithmically you get rid of emotions and can even get rid of any bias if you are strict about your strategy definitions. Letting computers run things (as well as backtest decades of historical data) is the only way to get rid of bias imo. My fundamental bias has given me fits for awhile. Anyway, I too agree that the decline from 1709 was a 5-wave impulse. Is it possible that the 5-waves completed at 1639.43 and that the move from there is an expanded flat B-wave? 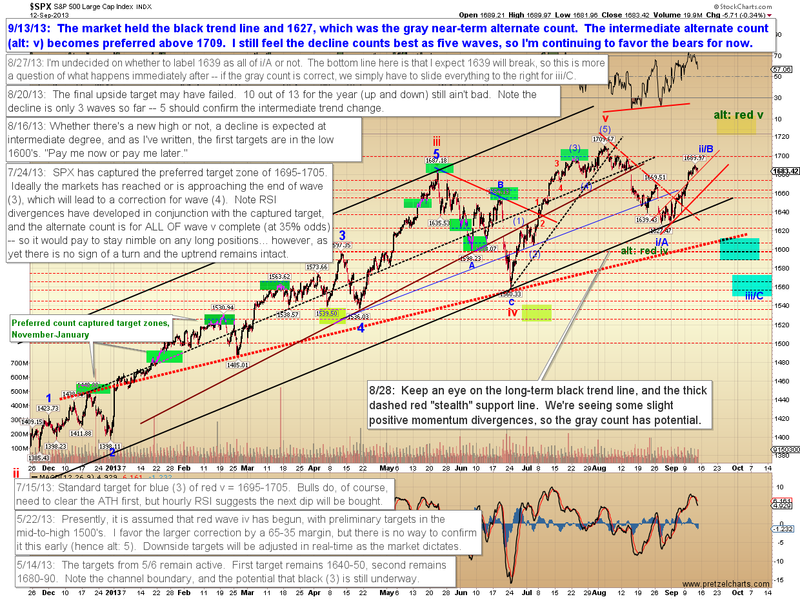 What has me thrown is the move from 1627.47-1641.18-1630.88-1646.41 looks like a 3-wave corrective pattern. 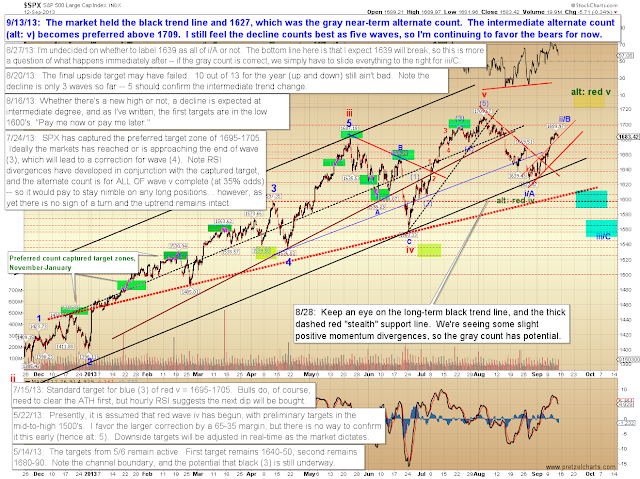 Could 1669.51-1627.47(A)-1646.41(B)-1628.05(C) be the B-wave as a running flat?, and the move from there a C-wave soon to complete?